Every week now I find myself wondering if this will be the last update of my twin pregnancy diary. I’ve gotten to know several twin mums throughout this pregnancy and I’m struggling to think of one that made it past 34 weeks, there must be some out there! This week I’ve made some big decisions and have been feeling so much happier. I know that what will be will be but now I finally have a plan in place it would be lovely if the babies stuck to that. 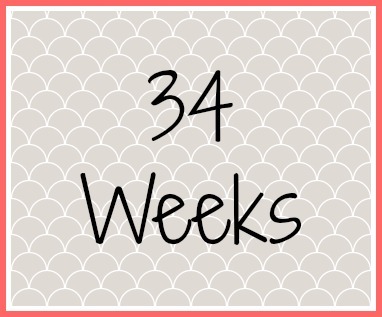 If you’ve been reading along each week you’ll know I’m expecting identical twin boys and I knew that depending on positioning and my own requests they would be delivered between 36 and 37 weeks either by induction or c-section. Last week I had my last official ultrasound scan so we could check the babies positioning and growth a final time. At 32 weeks they had both been head down but I had a feeling at least one had moved and they had. Twin 1 is still head down but Twin 2 is lying right across the top, squashing the legs of Twin 1 and making it very uncomfortable for me! Growth was still looking good but it was hard to tell with the positioning of them. I knew this week I would have to make a decision on the delivery. We had discussed it so much before this appointment that I had really made my mind up even before the scan. I wanted to go for a c-section; I had all my reasons ready and I had brought my husband with me for back up. There were many reasons why it was right for me but my main concern was the induction taking time and the experienced staff I would have wanted for a natural multiple birth not being available as I’m due around the Christmas period. I asked to see the Doctor who has been brilliant throughout my pregnancy as he seems to be more knowledgeable of multiple births; as soon as I mentioned the c-section to him I was told that was fine and not to worry, they would get me booked in. I knew instantly it was the right decision for me, even more so taking into account the position of twin 2. They would have let me try for a natural birth if that was what I had wanted but they weren’t very confident on safe delivery of both twins without intervention. I’ve been given some steroids and have a meeting booked with the anaesthetist and a pre-op booked in. I have heard all the good and the bad stories of both types of deliveries for twins and if I’m honest it got me in a muddle. I had to make the decision that was right for me, the babies and the rest of my family. Of course I am anxious about the recovery and how I’ll manage with twins and a toddler but we are lucky to have plenty of support close by. It will be strange to think we are going into a hospital, not in labour and preparing to meet our babies. I do feel like a weight has been lifted off now a decision has been made and yes, I do have a date but it is a little surprise!